Impatiens (Impatiens wallerana) is an annual flower that thrives in partial to full shade. They produce colorful blooms from early summer to fall. Their leaves are an attractive dark green color, though under the wrong growing conditions, they may turn yellow. Healthy impatiens should display colorful blooms and green leaves. Downy mildew is a fungus disease that affects impatiens. In addition to premature leaf fall and stunting, other symptoms include yellowing leaves. Other diseases affecting impatiens include verticillium wilt and botrytis blight. Both diseases also cause leaves to turn yellow. Fungicides may help treat the impatiens in the early stages of any of these plant diseases. Over-watering impatiens may cause leaves to turn yellow. To prevent this, keep the soil moist between waterings. Alternatively, too little water may cause impatiens' leaves to turn yellow as well. If the soil is dry and yellow leaves appear, it's time to water the impatiens. Impatiens requires a monthly application of a water-soluble fertilizer. Not getting the correct amount of fertilizer may stunt plant growth and turn leaves yellow. 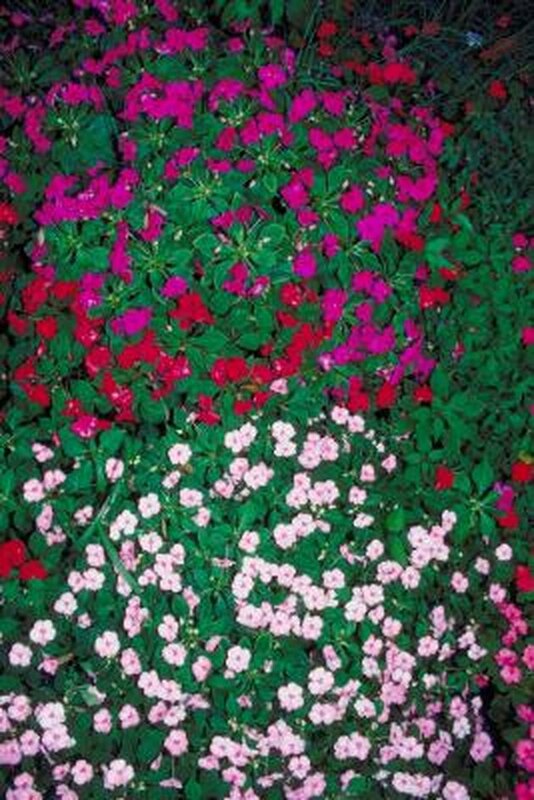 Always follow the recommended application rate when applying fertilizer to impatiens.